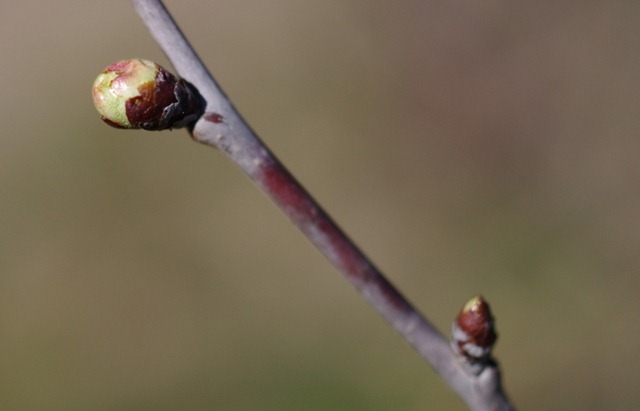 In the garden, with the air filled with the scent of apricot blossom and the sound of bees around the tree, the wild cherry buds are beginning to appear on our sapling, planted just a couple of years ago. 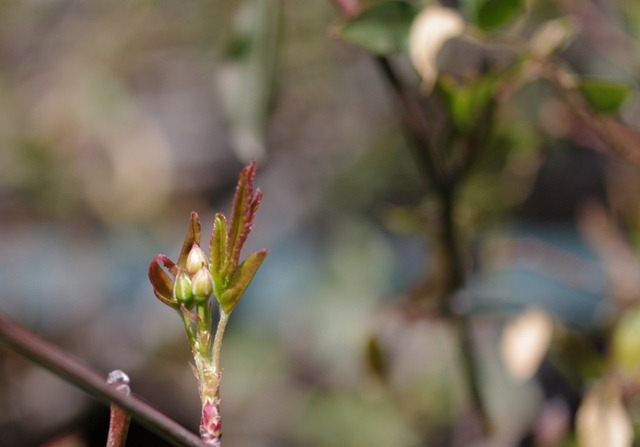 Leaf and flower buds are appearing on the Rose banksiae. I was worried about it because it began to flower in January (much too early) and those buds were killed by the cold weather, but it seems now to be recovering and flourishing after its pruning last autumn. It’s St Joseph’s Day today, the date when it’s traditional here for haricot beans to be sown, and we sowed our first row. Although the instructions on the packet suggest the end of April as the earliest sowing date, this is for more northern climates and here all the gardeners sow them at the end of March. We’ll sow several more rows later in the spring to ensure a steady supply. Back home after our morning’s work, we started our lunch with some leftover foie gras on toasts and then ate Lo Jardinièr’s adaptation of a recipe for pumpkin and chickpea salad from Sam and Sam Clark’s Casa Moro, adding feta cheese to the pumpkin and arranging it all on a green salad with parsley and sorrel from the garden. 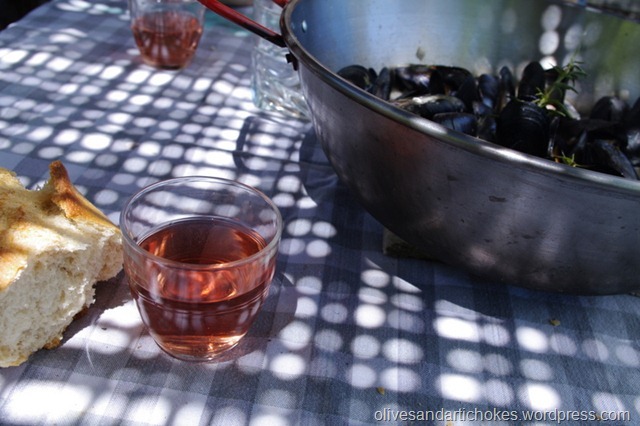 Summer starts here, for me, with these firsts, as well as some small peppers which were delicious grilled whole with one of the aubergines on the barbecue. Some mackerel fresh from this morning’s market followed, but I didn’t take pictures. And another half kilo of haricot beans which I’ve put in the freezer. 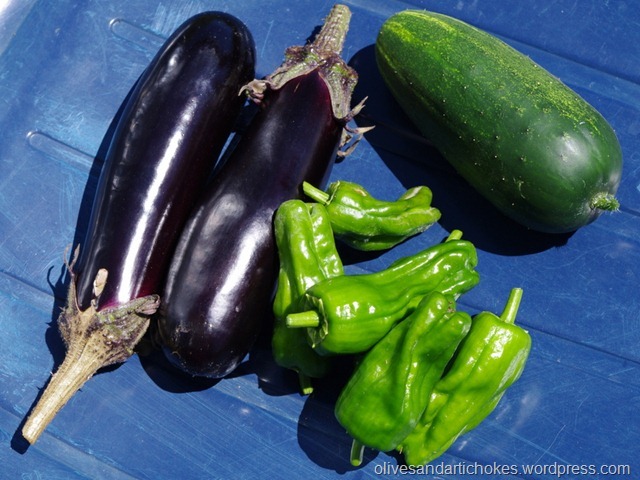 It was 34 C this afternoon – a real summer temperature – so the vegetables need a lot of water these days. As the sun went down and darkness fell I went out to see if I could catch the eclipse of the moon, but I think it’s too low on the horizon and can’t be seen from the village because we’re surrounded by hills. 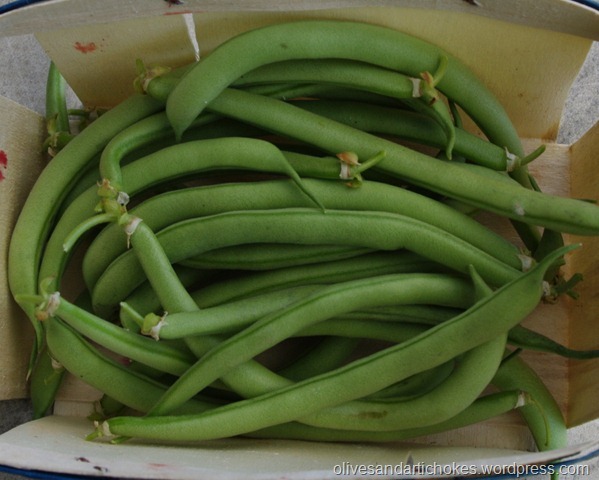 Our haricot beans have done better this year than ever before, with the second sowing (end of April) almost catching up with the first sowing (end of March), and today I noticed that there were enough beans ready to pick for a first meal. There’ll be a lot more in a few days’ time too, and I must remember to sow some more soon. With most of our planting done now – 70 tomato plants, 70 pepper plants, 15 aubergines and numerous courgette, pumpkin, cucumber and melon plants of different varieties – we were able to relax a bit in the garden today. 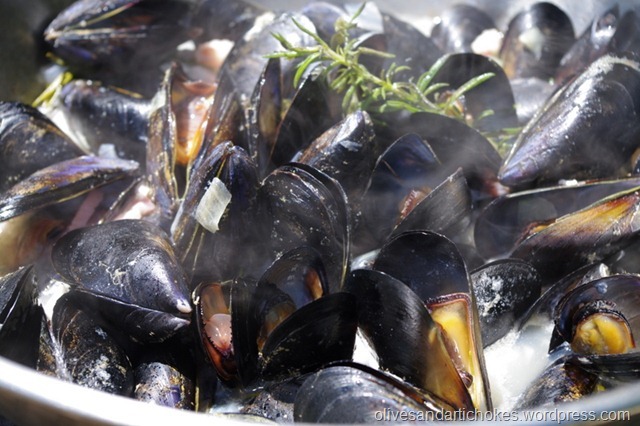 We bought a kilo of mussels from the producer’s van that comes to the village from Bouzigues every Saturday morning and we cooked them on the barbecue – la brasucade de moules as it’s called in French. 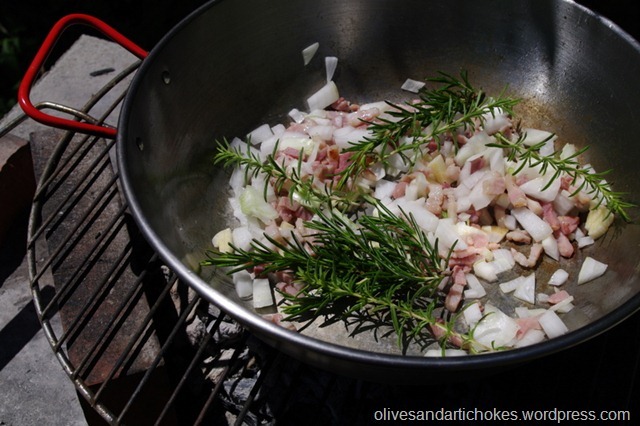 Once the fire was going well I cooked some lardons, pieces of bacon, then added a chopped sweet onion and cooked that for a couple of minutes, and then some chopped garlic and sprigs of rosemary and savoury. 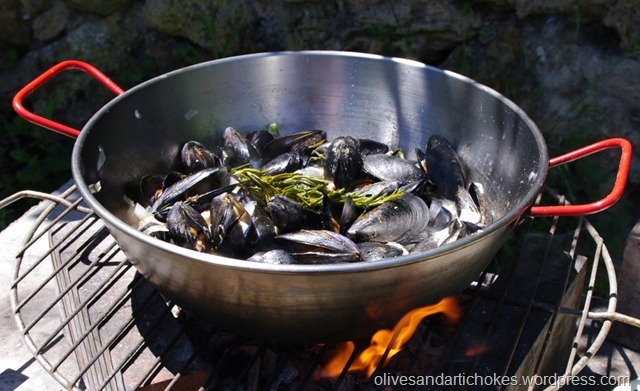 Then I added the mussels (about 500 gm per person) and cooked them until they had all opened – about 10 minutes. This isn’t a dish to be polite with – we just put the pan in the middle of the table so that everyone can help themselves. 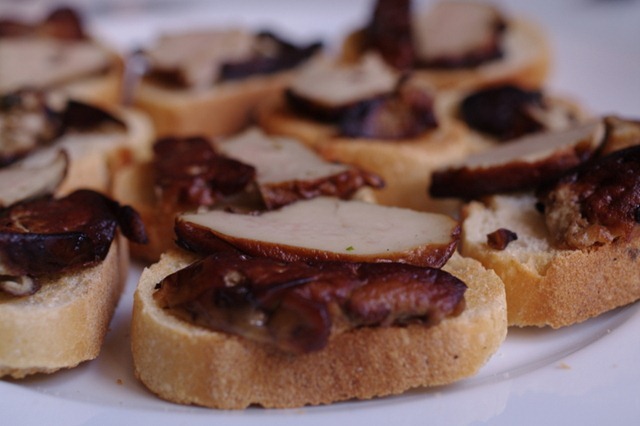 Serve it with crusty bread, for dipping into the juices, and a glass of chilled wine, white or rosé. 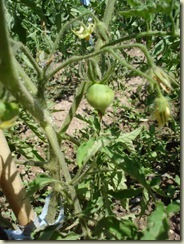 The tomatoes are ripening and the best time of day to work in the garden is the early morning before it gets too hot. 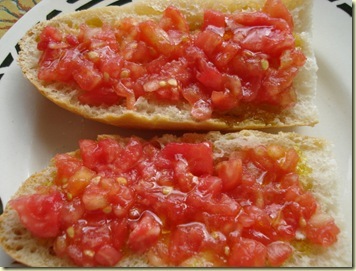 This morning in the garden we picked tomatoes straight from the plants to make the breakfast we’ve had in Catalunya and in Andalucia: peeled, chopped tomatoes with salt and olive oil on bread. A wonderful start to the day! 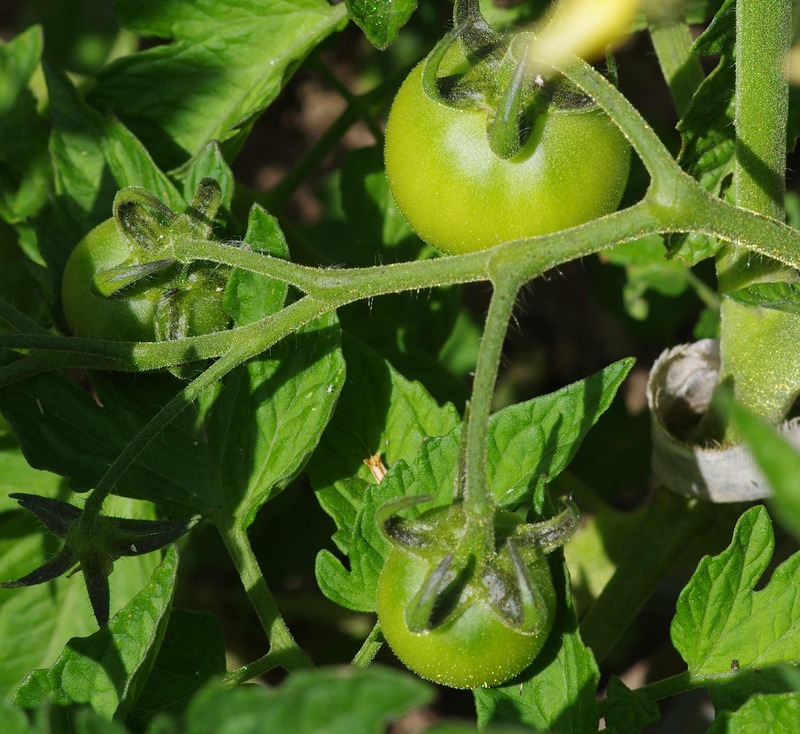 Les tomates murissent et la meilleure heure du jour pour travailler au jardin est le matin avant qu’il fait trop chaud. Ce matin nous avons ramassé des tomates pour faire le petit déjeuner que nous avons mangé en Catalogne et en Andalucia: des tomates pelées et hachées avec du sel et de l’huile d’olive sur des tranches de pain. Haricot beans, courgettes, tomatoes, peppers, cucumbers and aubergines. 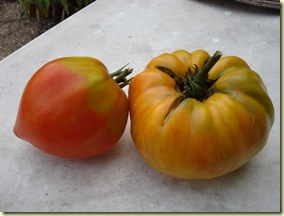 The Ananas tomato on the left above weighed 430 grams. 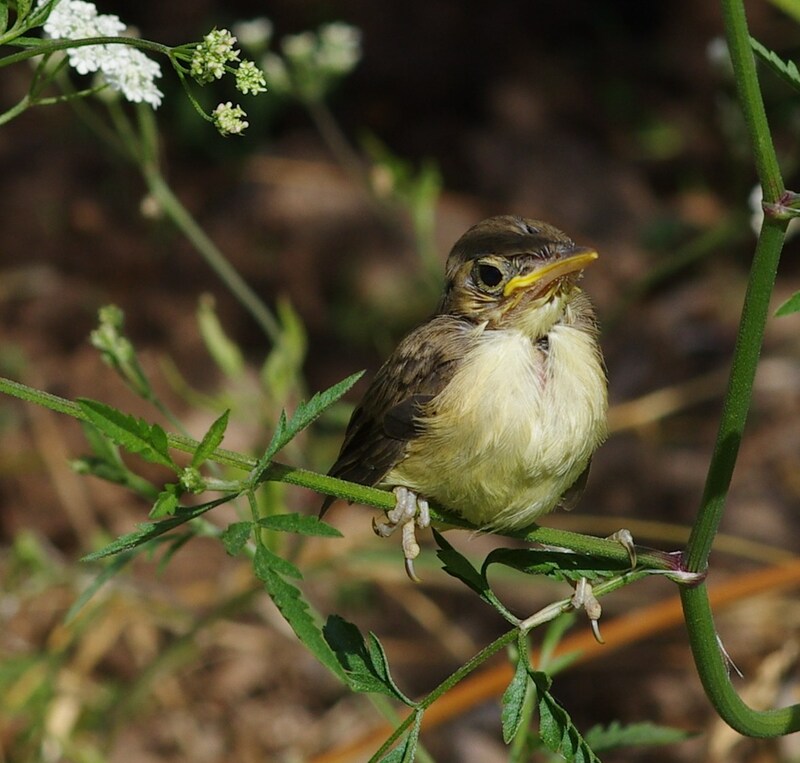 There are rumours that it may be even worse than we feared and that the felling of plane trees in the village is part of a wider plan to cut down all the plane trees in the Hérault and Aude départements. There will be a meeting next week to discuss the situation and what we can do about it. On dit que peut-être c’est pire que nous avons craint et qu’il y a un project d’abattre tous les platanes dans l’Hérault et l’Aude. Un réunion aura lieu la semaine prochaine pour discuter ce qu’on peut faire. Today has been the hottest day of the year so far, over 30 degrees C at midday, so how is everything doing in the garden? / Aujourd’hui on a eu la journée la plus chaude de l’année jusqu’à ici. 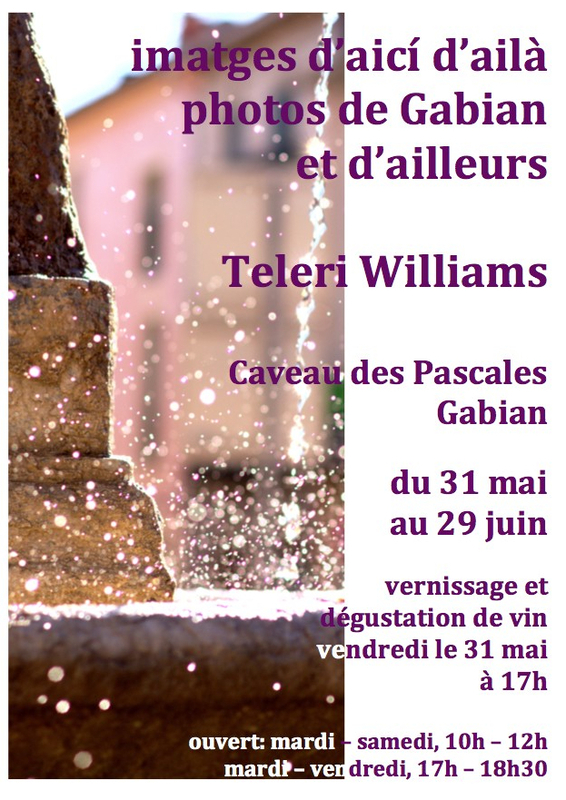 Donc, comment va le jardin? The leek flower has finally come out / La fleur de poireau s’est finalement ouvert. 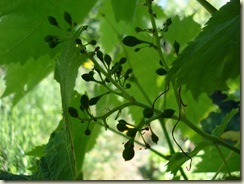 We hope it will provide us with a lot of seed / Nous éspèrons que cette fleur nous donnerons beaucoup de semences. 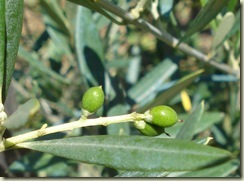 The olives are growing – these ones on our Lucque tree, the first year it has had olives on it. 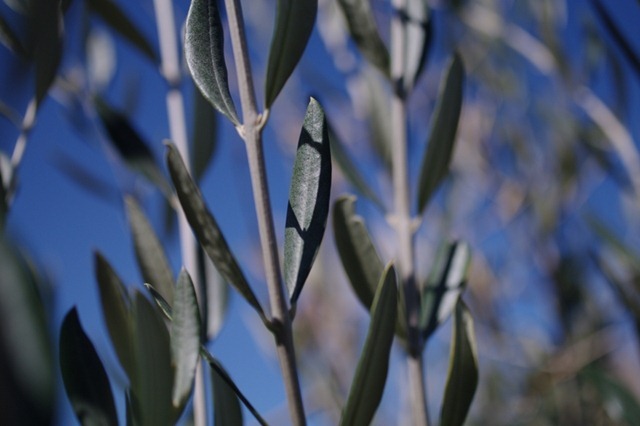 Les olives poussent sur le Lucque. 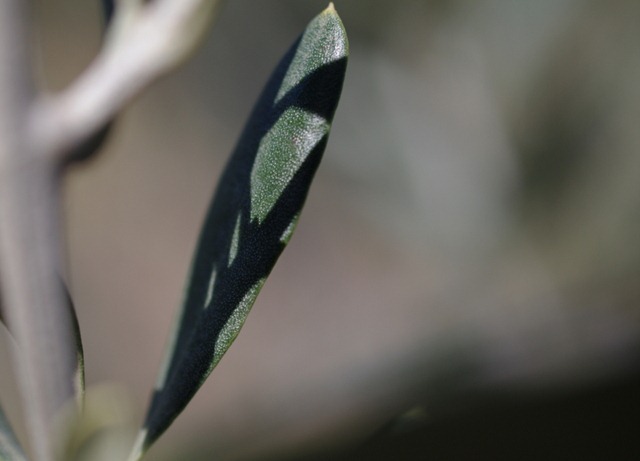 Ces sont son ses premiers olives. We have beans on the haricots (Beurre and Purple King) and the Borlottis (left above). / Nous avons des haricots verts (Beurre et Purple King) et Borlotti (gauche). 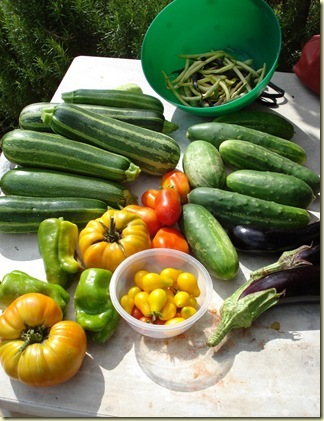 The peppers and tomatoes are growing / Les poivrons et les tomates poussent …. 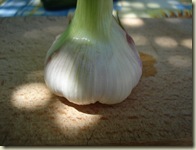 The garlic heads are small but better than last year / Les têtes d’ail sont petites, mais mieux que l’année dernière. We’re eating courgettes every day and I stuffed some of the flowers with mint to cook on the barbecue. 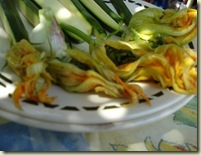 / On mange les courgettes tous les jours et j’ai fait des fleurs de courgette farcies à la menthe. The stream from the spring is still running well, so we have plenty of water – we hope it continues. / Le ruisseau de la source coule bien toujours, donc on a beaucoup d’eau – on éspère que ça continuera. Any failures? Well, yes. 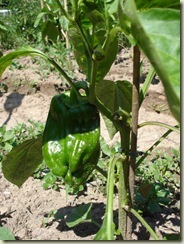 The pepper plants we grew from seed haven’t grown well at all and we’ve had to buy plants. Everyone here says the same. 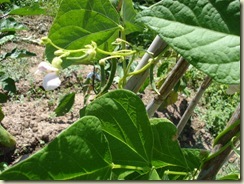 A lot of our bean plants, especially the climbing ones have been eaten by birds as they germinated. We’re protecting the new sowings with straw now and that seems to be working. 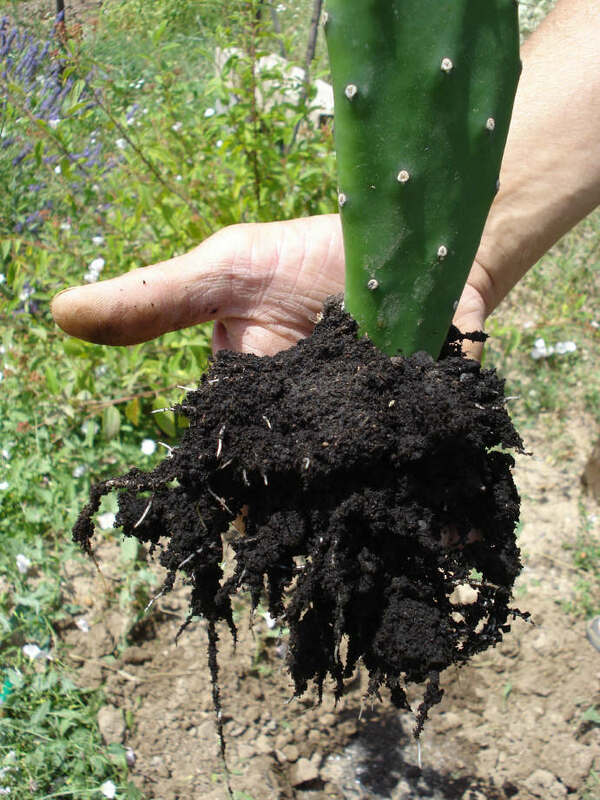 Our garden needs a lot of organic material to improve the soil and to help it retain water during the dry summer. This morning we went a few kilometres into the hills to the Mas Rolland goat farm to collect manure. It’s a beautiful drive, around hairpin bend after bend climbing between slopes covered with garrigue and holm oak trees (the Mediterranean evergreen oak) and rocky limestone outcrops. 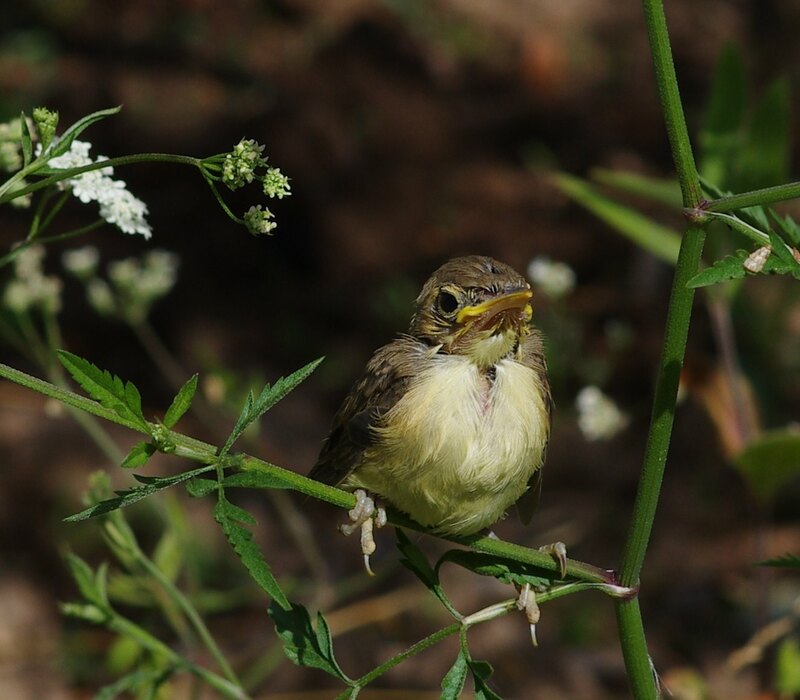 Notre jardin a besoin de beaucoup de matière organique pour améliorer la terre et pour aider la retention de l’eau pendant la secheresse de l’été. Ce matin nous sommes allées quelques kilometres à la ferme de chèvres de Mas Rolland pour chercher de fumier. 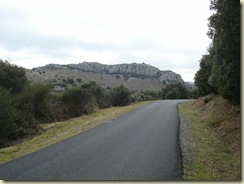 C’est une belle route – des virages en épingle à cheveux montent entre les collines couvertes de garrigue et de chênes verts et les affleurements de calcaire. We took a trailer full of manure back to the garden and spread it on some of the beds we’ve cleared. / On a apporté une ramorque pleine de fumier au jardin et l’a mis sur la terre qu’on a nettoyé. This was hungry work so we went home to eat a hearty peasant lunch of haricot beans cooked with salted belly pork which I’d prepared yesterday. 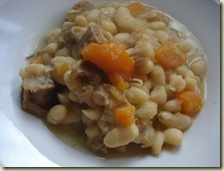 / On est rentré chez nous pour manger un bon repas paysan – des haricots cuits avec de la poitrine salée que j’ai préparé hier. 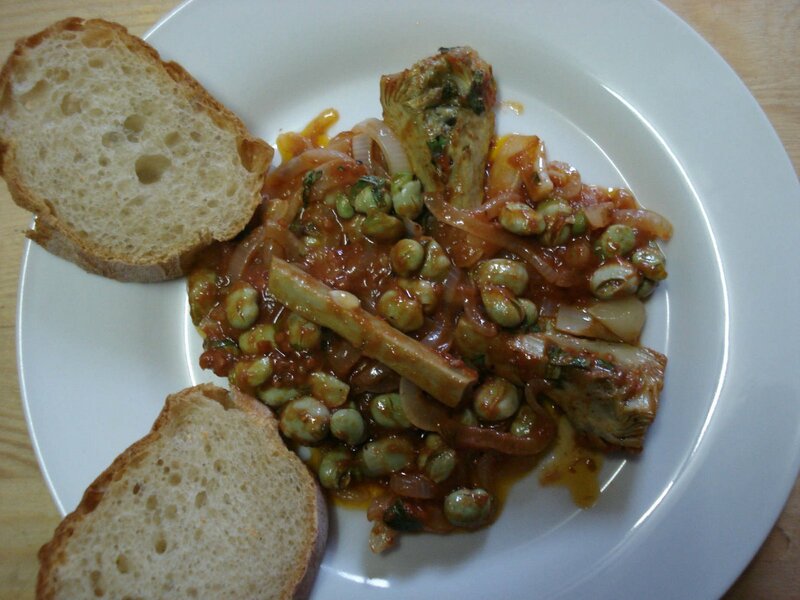 The recipe will be on the Mediterranean food blog. 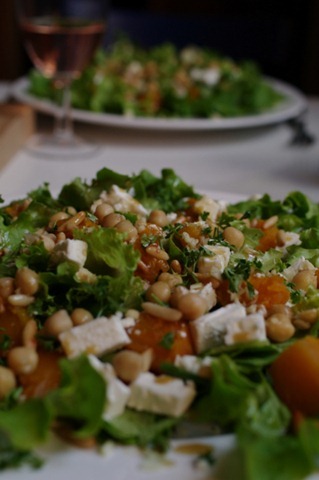 La recette sera sur le blog de la cuisine mediterranéenne. Last night snow settled in Gabian – something we’ve never seen here before – just a light icing on the cars, roofs and plants in pots outside the windows. By the morning it had almost all gone. Hier soir la neige est tombée à Gabian et elle est restée sur les voitures, les toits et les plantes dans les pots à l’éxtérieur des fenêtres. Ce matin elle est presque disparue. 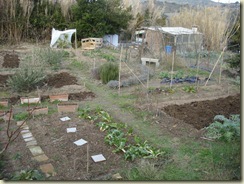 Although it was still cold, after the snow melted and the sun came out our thoughts turned to spring seeds and planting. We want to try some new varieties this year so from Kokopelli we ordered some pepper (capsicum) seeds which we haven’t grown before: Kandil Dolma – a Turkish bell pepper suitable for stuffing – and some long red varieties for salads and grilling and perhaps for drying: Italian Red Merconi, Lipstick, Corni di Toro and Kolesca. And from Seeds of Italy (Franchi) we’ve ordered Cavalo Nero (recommended by Michelle at From Seed to Table, Radicchio orchidea Rossa, Borlotto bean Lamon, some French beans – a dwarf Purple King and a climbing Smeraldo – and Raperonozolo Rampion. I’m especially excited about the last of these, the rampion, lo reponchon in Occitan, as it grows wild in the garrigue here and is mentioned by Max Rouquette in his poem, ‘La Lenga s’es Perduda’. Bien qu’il fasse froid encore, après la neige s’est fondue et le soleil est revenu nous avons pensé des semences de printemps et de la plantation. 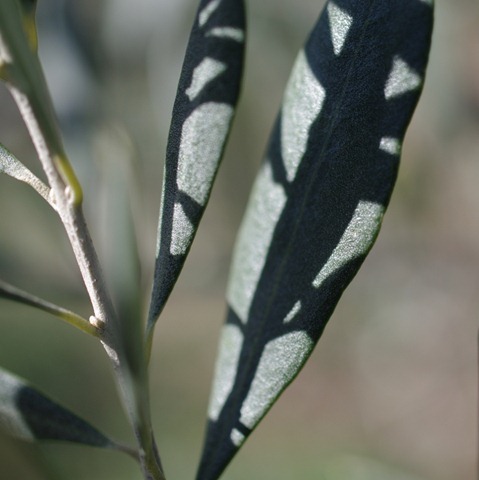 Nous voulons essayer des nouvelles varietés cette année, donc nous avons commandé de Kokopelli des semences de poivrons que nous n’avons pas cultiver: Kandil Dolma un poivron turque qui est bon pour farcir, et des autres varietés pour les salades, pour griller et peut-être pour secher. Nous avons commandé aussi des semences de Seeds of Italy (Franchi) y compris Cavalo Nero (recommandé par Michelle de From Seed to Table) et Raperonozolo Rampion. Je suis ravie de trouver cette dernière varietée – le raiponce, lo reponchon en Occitan – qui est une des plantes de la garrigue, le nom de laquelle j’ai trouvé dans une poème de Max Rouquette, ‘La Lenga s’es Perduda’. I can’t wait now for the seeds and the spring to arrive! J’attends avec impatience l’arrivée des semences et du printemps! 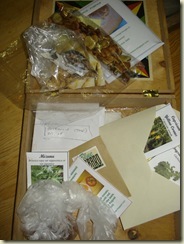 And we have a lovely box full of vegetable seeds we’ve saved or friends have given us, some which Kate brought us and some Mizuna left from the packet Laura sent us. But any other suggestions are welcome. 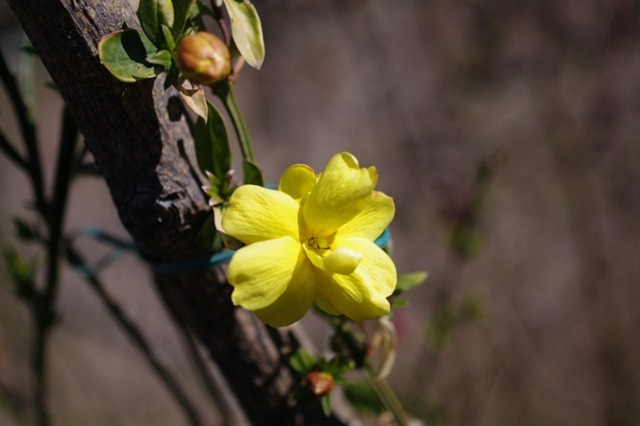 I learnt a new Occitan greeting this week – ‘Bon anada, plan granada!’, which means happy new year and may you have seeds for a good year. I think we have! 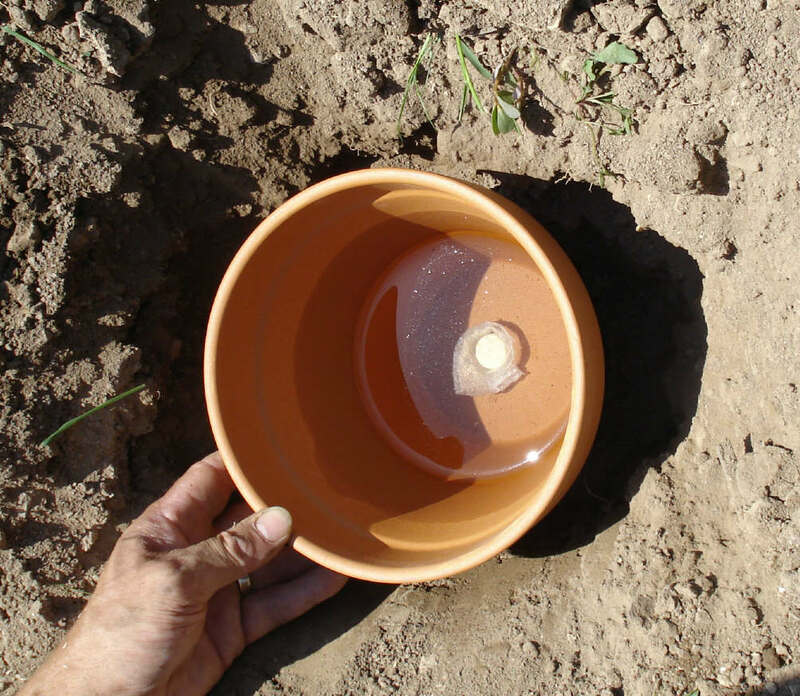 >About a week ago we installed the terracotta pot watering system, as suggested by Kate at Hills and Plains seedsavers, but a less sophisticated system than hers. We‘ve started with four pots and plugged the holes in the bases with corks. 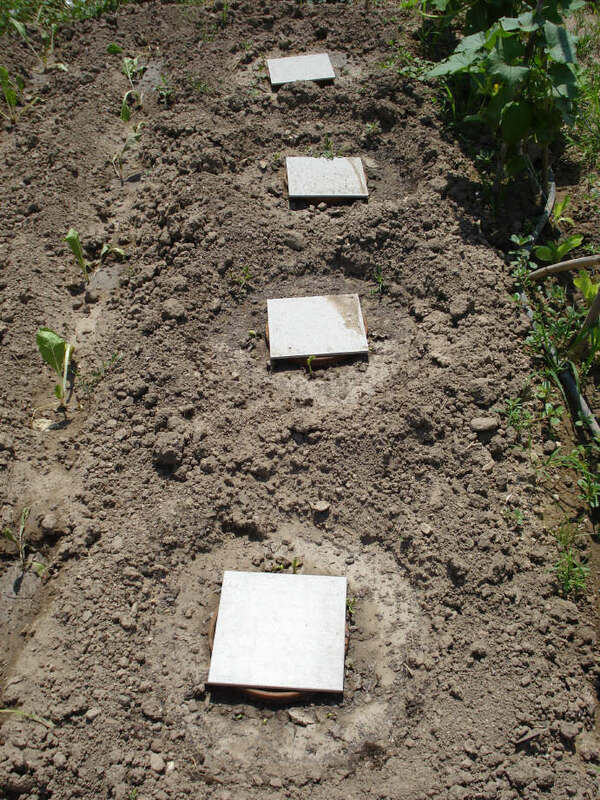 We dug holes for them and filled in the space around them with a mix of soil and compost. We‘ve used old floor tiles as lids and unlike Kate have not connected them to a hose for filling up. We may do this next year, but this time we‘re just going to fill them up with a watering can or a hose by hand. 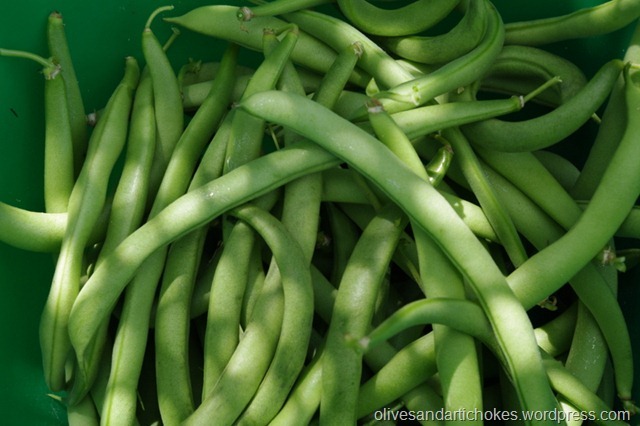 Once the row of pots were in, I sowed haricot verts (French beans) around the pots. 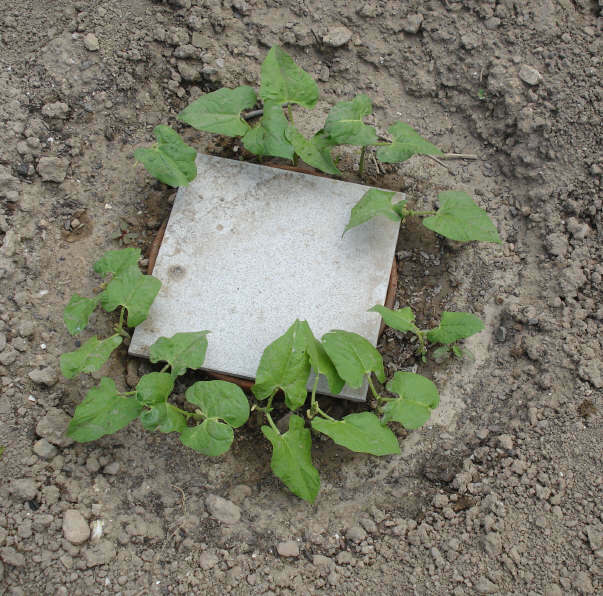 I watered the soil where the seeds were, around the pots, until they germinated. Now that they have germinated we‘re watering straight into the pots and it seems to be working well. The soil around the pots seems to be damp all the time. And, an added bonus, the snails have left the seedlings alone. 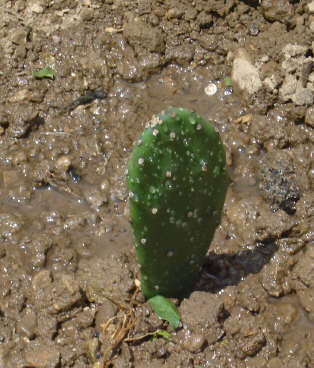 I think this is because the surface of the soil isn‘t damp. In the past we‘ve lost whole rows of haricots to the snails and had to use snail pellets to protect them. The four cuttings have grown quite an extensive root system in only three weeks. This surprised me as the information I could find suggested that they would take some months to root. Two of the plants have now been transplanted to the garden. I‘m hoping to grow the other two in pots outside the house. 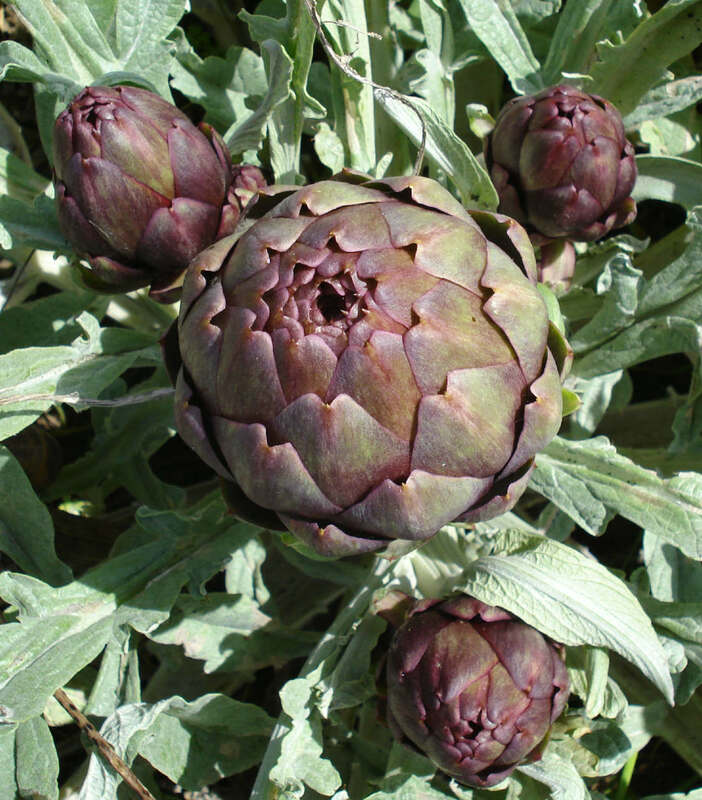 Cut the outer leaves off the artichokes and remove any choke – if the artichokes are small like this one there won‘t be any choke. You can either leave the artichoke hearts whole or quarter them. 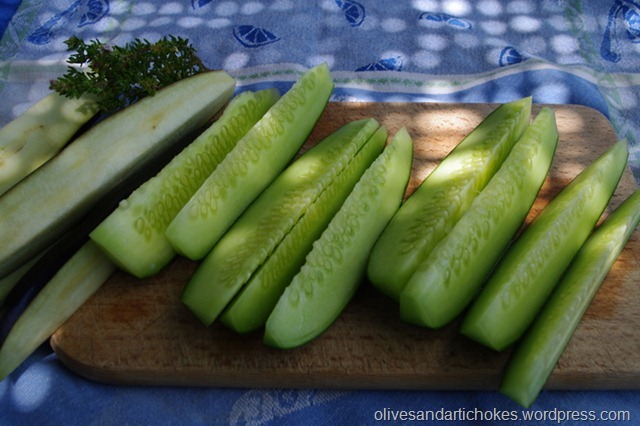 Simmer these with the peeled stalks in a mix of olive oil and a little white wine until they are tender. Meanwhile simmer the broad beans in water (for just a couple of minutes if they are young fresh ones like I picked today) and sauté the onion and garlic in a little olive oil. Mix all the ingredients together, including the oregano, tomato, salt and pepper, and serve warm or cold. After the rain the garden is very green and it‘s hard to imagine that in a couple of month‘s time it will all be dry, except where we water, and will stay like that till September. I sowed haricot beans, the first sowing of the season. I‘ve bought some snail pellets which claim not to harm animals and to be usable in an organic garden. Last year the snails ate my haricot bean plants as soon as they had two leaves, so I‘ll be watching them carefully this year and I‘ll use the pellets if necessary. I don‘t mind if the snails take the odd bite of a leaf, I‘m willing to share, but I don‘t want them taking the whole plant! I‘d welcome any suggestions about how to deter them.